The University of Maryland (UMD) began its expansive enterprise GIS initiative with a simple basemap of its flagship campus in College Park, Maryland. 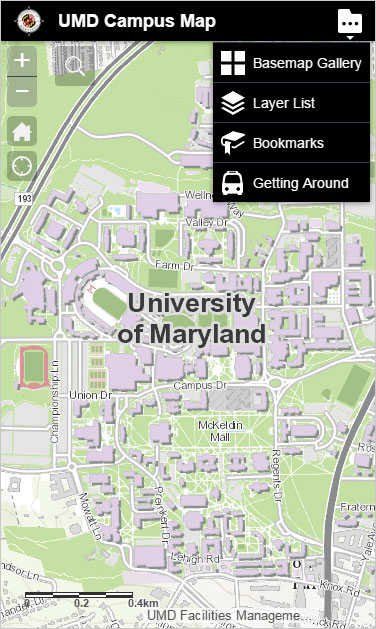 The award-winning UMD Interactive Campus Web Map is optimized for use on both desktop browsers and mobile devices. When Taylor Keen was appointed campus GIS coordinator at UMD in 2010, the campus was just beginning to move away from using CAD with a nonstandard local coordinate system for its facilities mapping needs. 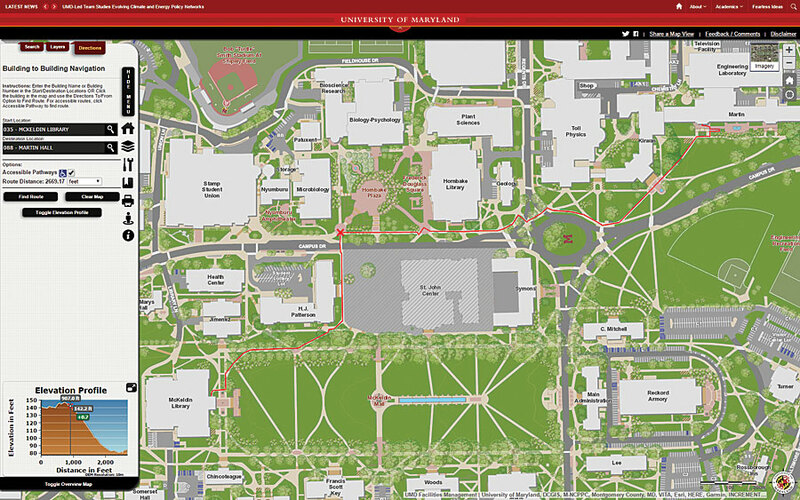 After completing the basemap, Keen led a small team to develop the prototype of a campus web map that, a few years later, became the basis of the award-winning UMD Interactive Campus Web Map. Optimized for both desktop and mobile use, the web map provides a comprehensive set of tools to explore the university’s sprawling 1,340-acre semiurban campus that includes more than 250 buildings, 20 miles of roadways, 66 miles of sidewalks, and nearly 15,000 inventoried botanical assets. Users can search for campus features and view related information about buildings, parking lots, and amenities in pop-ups. In addition, they can automatically determine the optimum route between facilities. Esri World Elevation Services and Google Street View are also incorporated into the map for pedestrian pathway navigation. One of the web map’s most popular functions is its ability to access metro train and bus arrival time information and display current bus locations through its live tracking capability. UMD has had an Esri academic site license since 1997, and in 2010, the emerging campus GIS team determined that a number of departments in the university’s administrative services could benefit from implementing GIS technology. 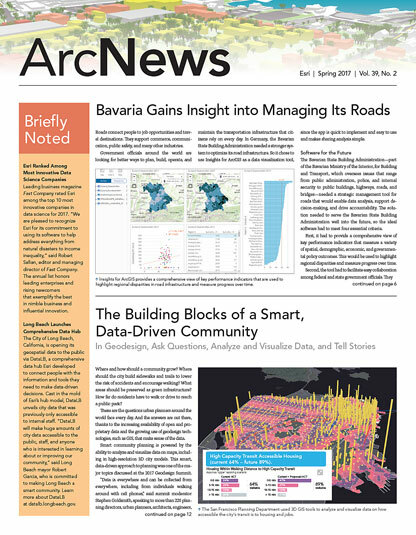 Centralized university mapping resources would allow spatial information to be shared across departments, provide the opportunity to develop collaborative mapping and information products, and reduce redundancies in projects and data management—ultimately increasing operational intelligence and ensuring access to the best possible information being maintained on campus. Thus, to advance GIS at UMD, Keen helped establish the multidepartment Campus GIS Steering Committee, which developed an enterprise GIS implementation plan and presented it to the university’s administration in 2013. To accommodate as many different institutional perspectives as possible and increase the implementation plan’s potential for success, the steering committee and its various task forces were composed of stakeholders from several different departments. They included Facilities Planning, Facilities Management IT Services, Campus IT, Transportation Services, Public Safety, Administration and Finance, Conference and Visitor Services, and the academic departments of Geographical Sciences and Computer Science. “System sustainability was also addressed in the plan and included upkeep and data governance agreements for those departments contributing data to the system,” said Keen. UMD’s enterprise GIS and web mapping platform has been online and in use since the release of the campus web map in November 2013 and has proved very successful. Students use the campus web map to determine the optimum routes between facilities. “It continues to grow along with our user base,” said Keen. Esri’s Local Government Information Model (LGIM) was implemented as well to ensure standardization in the data management processes and workflows. Several campus divisions currently use the enterprise GIS and are contributing to maintaining its data. The Public Safety Department utilizes the campus basemaps for its dispatching system and has helped keep up various inventories—including emergency telephones and street signs—with Collector for ArcGIS. The Department of Transportation Services maintains a number of inventories as well, including parking lots, metered parking spaces, and campus bike racks. Many of its inventories are also featured in the public campus web map. Additionally, the Department of Dining Services has contributed layers to the web map and features a version of the map—with its services embedded in it—on the dining locations website. Cloud-based services are an area the university wants to examine to reduce costs and administrative overhead in managing the servers and services. Keen is also planning to explore other ways of applying GIS at UMD. The university still maintains building floor plans and master utility datasets in CAD format, but it is developing transformation tools to move them between both the GIS and CAD environments. Keen’s group will be investigating the ArcGIS for AutoCAD plug-in to see if it can be used to simplify these workflows. This would allow the university’s CAD users to work with enterprise GIS datasets in the AutoCAD environments they are familiar with. And now, according to Keen, UMD has an established enterprise system in place that can support real advancement in these areas.